Many Airbnb users have stretched the boundaries of what counts as a shareable space on the site, including the creators of the Cambridge Igloo. But new listings in New York City strike a more serious note. 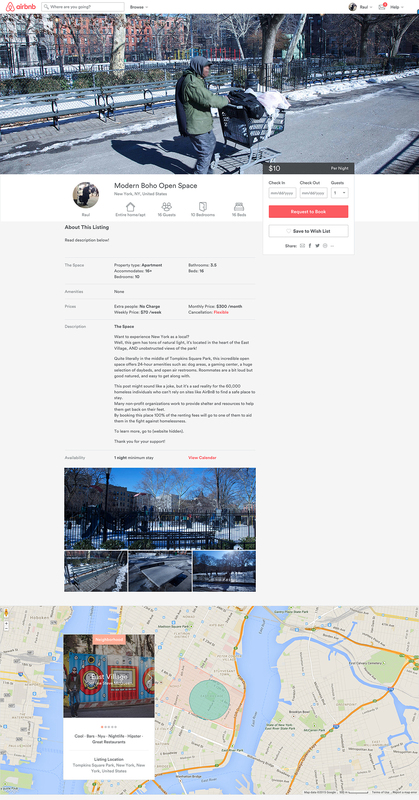 The “Homeless Airbnb’’ project, created by Vito Catalani and Jamie Shin, features listings in locations where some of New York’s roughly 60,000 homeless residents actually sleep. The project aims to raise awareness not only of the economic disparity in the city, but also of a population that is all too often invisible. The project hasn’t spread to Massachusetts, but has strong resonance in the state, which has the fastest rising homeless population in the country. Catalani and Shin thought of the project when they were helping a friend look for a temporary place to stay on Airbnb. On the same day, they noticed more homeless people than usual in the streets. Catalani and Shin realized it was easy for many people to find somewhere to stay—just go online and click around. But it’s very hard for the homeless. Click for a full-sized image of this Airbnb listing. Catalani said that Airbnb users who have seen the listings have responded positively, though some were confused at first. This isn’t the duo’s first time facilitating a public social-service project—they pioneered “TipBombing’’ last summer—but it’s their first on such a global platform. Initially, Catalani and Shin planned to accept donations for homeless shelters through the listings, Catalani said. But instead they decided toprovidelinks to some New York City shelters in hopes that people will donate to them directly.